A place to cultivate the self through an exploration of traditional martial arts, fine arts and crafts, sustainable living, yoga and contemplation. Pincus Sensei brings over 30 years of aikido experience to his classes. He studied under several direct students of O Sensei, beginning with the late M. Kanai Sensei (8th degree black belt) in 1982. During his undergraduate years studying philosophy, he apprenticed with the late Paul Sylvain Sensei (6th degree) and Y. Yamada Sensei (8th degree), Chairman of the United States Aikido Federation, Eastern Region. At New York Aikikai, he also studied under the late Seichi Sugano Sensei (8th degree) and became a student of Donovan Waite Sensei (7th degree). Seeking to deepen his understanding of Aikido after deciding to become an Aikido teacher, he studied in San Diego with K. Chiba Sensei (8th degree) in a kenshusei (intensive instructor’s training) program. He founded Aikido of Champlain Valley (ACV) in 1997 as a federal 501(c)3 educational organization, in Burlington, Vermont where he is also currently the Chief Instructor. Pincus Sensei presently holds the rank of Rokudan (6th degree black belt) and shidoin (certified instructor) with the United States Aikido Federation, Eastern Region and the International Aikido Federation in Tokyo, Japan. He is sandan (3rd degree) in Muso Shinden Ryu Iaido which he began studying under Paul Sylvain Shihan. Albright Sensei began Aikido in 1993 with Arnie Dinowitz Sensei and Liz Dinowitz Sensei at Monadnock Aikikai, in Keene, NH. 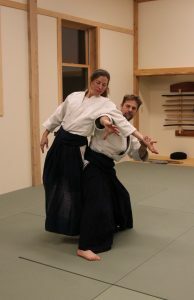 She became soto-deshi to Benjamin Pincus Sensei in 1997 when Aikido of Champlain Valley opened at its original location in Winooski, VT. Heidi and Benjamin were married in 2000 and are raising two sons. In 2007 Albright Sensei graduated from the Aikido of Champlain Valley soto-deshi (intensive training) program. She was awarded full instructor certification (shidoin) and the rank of Godan (5th degree black belt) in 2017 from the United States Aikido Federation, Eastern Region and the International Aikido Federation in Tokyo, Japan. In addition to being a mother, she holds a M.S. in Biology, is an artist, flower farmer and graphic designer. In her spare time she enjoys riding and driving her horses.